Technology is continually advancing allowing for new door lock systems. In this current modern age, offices are choosing electronic locks and entry systems. Wireless and keyless entry systems seem to be in so many places these days. Keyless locks and keypad entry are being implemented in many offices as a more advanced security and access for better peace of mind. The keyless entry is definitely worth the cost, which tends to be more expensive than a keyed lock entry. In commercial real estate the term "Secure Keypad Entry" generally denotes that a space is accessible 24/7 by you without the need for building staff (such as a door man, security guard, or conceirge) to permit you entry. This is a great perk and the expected standard these days - especially with office tenants who commonly work differing shifts while some businesses conduct certain facets of business at night. Regardless 365 day 24/7 hour building access is a customary feature in most commercial highrises throughout Manhattan today. Do you have multiple employees or high turnover? A larger business with a considerable number of employee or increased staff turnover are opting for an electronic entry system. 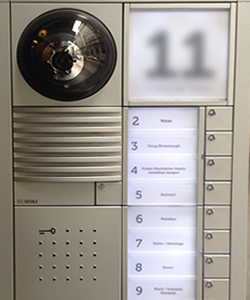 A keyless entry system simplifies the process of securing the office after an employee exits. To rekey the lock for a building and office is costly and time consuming which is helpful when an ex-employee leaves with the keys. The process of “rekeying”, with a keyless entry, is reprogramming access codes for new and old employees. Do you have contractors or vendors that need temporary access to your property? As the office needs renovation and construction, contractors and vendors will require entry to the office. Contractors and vendors may request access during construction or for after-hours deliveries. A keyless entry allows business owners and managers to program access codes for limited access at specified times. The access codes can have an expiration date when the construction is complete. Do you want to control when people come into your property? Many business owners and managers can supervise employees and limit access to the office during particular hours. A keyed entry allows 24-hour access to the office while a keyless entry allows managers to control the access. A keyless entry is a great solution allowing managers to program codes to deny access during off-hours and allow access during business hours. Do you want to know when personnel enter? Would you like to monitor when employees enter the building and exit the building? Monitoring the time at which employees enter and exit may be helpful for payroll uses and in the unfortunate times of suspicious behaviors. A report of any entry information can be provided by the keyless system that is more convenient than manual tracking. Do you need to lock exterior entrances from ingress in emergencies? Understandably, worst-case scenarios are something we do not like to think about, but should plan accordingly. The ability to wirelessly lock exterior doors to restrict any dangerous people or situations from entering the office or building is a life or death scenario. The keyless entry offers a way to lock all doors with a click of a button. This function hopefully will not be needed, but this is a comforting function to have for the office. 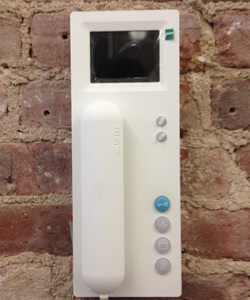 Are your searching for a commercial space featuring keyless or keypad entry systems? When you are searching to lease or own office space in Manhattan, the process itself may be intimidating. Especially when there are many requirements for the space. Our brokers can assist in easing the process and finding the right space to match your requirements. We would like to offer our insight and information at no obligation or fee.